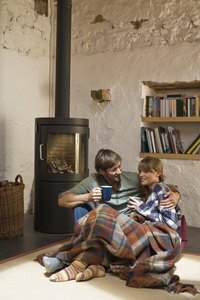 Wood-burning stoves keep your home warm and provide the added charm of flickering flames in the hearth. Today's wood stoves burn efficiently and pollute less, but any heat source can be a fire hazard if it isn't installed properly. The correct size and type of stove pipe will help your stove heat efficiently without the threat of burning down your home. Local building codes may dictate the type of pipe you need to use. Single-walled stove pipe is metal pipe of various thicknesses, painted black. This pipe gets super hot, so it you use single wall stove pipe you'll need to keep it at least 18 inches away from walls, drapes or anything combustible. Some building codes require a distance of 36 inches. The pipe runs only to the ceiling, where it meets a special metal collar that passes through the ceiling to connect the pipe with a metal or masonry chimney. Never run single-walled stove pipe through the attic. Double-walled stove pipe consists of two layers of metal with an air space in between. The exterior of this pipe doesn't get as hot as single-walled pipe, so you only have to keep this pipe six inches away from anything that may catch fire. For this reason, double-walled pipe is also called close-clearance pipe. But like single-walled pipe, double-walled pipe is only designed for use between the stove and the ceiling. Don't use it in the attic. Though people sometimes think of the metal piping that juts above the roof as a continuation of the stove pipe, that's an incorrect perception. The piping from the ceiling to above the roof line is a specially constructed metal chimney. Wood stove chimney are designated as "Class A" or "High Temperature" chimneys. They are double- or even triple-walled pipe with fire-proof insulation. The chimney connects to the collar at your ceiling, passes through the attic and out the roof. You may need several sections of chimney pipe. Your chimney must extend at least three feet above the roof, and at least two feet above any part of the roof within 10 feet. Top the chimney with a cap to keep out birds and prevent sparks from escaping the chimney. No matter what type of stove pipe you use, you need to protect your home from fire by setting your stove on a fire-proof hearth and keeping the pipe the proper distance from walls and other flammable materials. Clean the chimney and stove pipe annually to remove build-up of creosote that can cause a fire inside the pipe. Check your local building codes and your homeowners' insurance to determine their requirements for clearances.